This is Book 3 of the “Wind Rider Chronicles” by Allison Reid, also known here as our esteemed colleague, “Weavingword”–and it’s a corker. When I reviewed Book 2, Ancient Voices, last winter, I predicted that these books, already quite good, would get better as the series went on–and how about that, I was right. To get the most out of this book, you ought to read Book 1, Journey to Aviad. 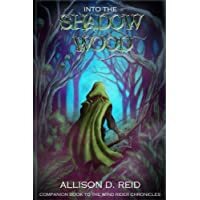 That’s because Into the Shadow Wood is sort of a mini-book, a little over 40,000 words long, written to tie up some loose ends left over from Book 1. But this little book is anything but an afterthought. These are solidly Christian books, suitable for readers 12 and up, based on a fully Trinitarian theology, and increasingly well-written. More than that, they are important books. Books like this have a mission. They are culture-savers; and if you can’t save the culture, you can’t save anything. When we read fiction, it’s a form of self-education. And it’s powerful: the fiction we consume does much to shape our outlook on life, our sense of right and wrong, and even our character. It’s no easy task to write books that can help carry out this mission, and we need a lot more of them. “The Wind Rider Chronicles” belong to that select category of books: books that are, as it were, special forces in the Culture War: Navy Seals, Green Berets, and Rangers charged with winning spiritual ground for Christ’s Kingdom in a fallen world. We as readers should support them. As for the story: Einar is a young warrior who goes into the Shadow Wood–an extremely dangerous place polluted by an evil spirit–to carry out a seemingly hopeless mission against an evil force of overwhelming strength. And he is handicapped by his own doubts and lack of faith. So we follow Einar into his own shadow wood of spiritual darkness, and it turns into a journey that has much to tell us about the power of prayer, the power of faith, and the power of love: which is to say, the power of God. I mustn’t say any more, for fear of spoilers, except that it’s a journey well worth making–and very well presented by the author. Her writing style has grown in expertise and power; and all I can say more is–read it! This entry was posted on Friday, January 6th, 2017 at 1:56 pm	and tagged with Allison Reid, Ancient Voices, christian fantasy, cultural musings, fiction as self-education, Into the Shadow Wood, Journey to Aviad and posted in Book Reviews, Fantasy Criticism, Pop Culture, religion. You can follow any responses to this entry through the RSS 2.0 feed. Thank you so much, Lee. I am truly humbled by this review! My greatest hope is to honor God with my series, and reach both believers and non-believers in a meaningful way. I’d like to add a word about how refreshing I found your writing style in “Shadow Wood.” Cliche free! Beautiful plain English! A nice smooth ride from cover to cover. Your art has come a long way in a short time. As for reaching your readers–well, as writers we can only do our best. Whether we reach anyone or not is more up to the Holy Spirit than it is to us. But good writing does make the Spirit’s job easier!